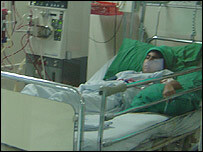 Uzma, an 18-year-old Pakistani whose kidneys had failed, was certain that she did not have long to live. 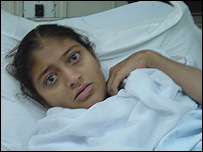 She had been on dialysis in Karachi for four years and was losing hope with every passing day. Then a lifeline was unexpectedly thrown in her direction from some 4,000 miles away. An accident victim in the Netherlands had stipulated that all usable organs in her body be donated to those in need when she died. A mere 24 hours later, through a co-ordinated effort between the Eurotransplant Foundation, Pakistan International Airlines and the Sindh Institute of Urology and Transplantation (SIUT), the kidney was transported and donated to Uzma. Two weeks after surgery, she is still in discomfort. "I won't be well unless I can go home," she said from her isolation ward in the intensive care unit of the SIUT. But she at least knows that she will live, unlike an estimated 8,000 to 10,000 Pakistanis who die of kidney failure every year for want of a suitable donor. What makes Uzma especially lucky is that her donor was a European. In Pakistan, religious scholars have criticised such transplants, and have lobbied the government against enacting legislation that would allow them to take place. It is a move that has had alarming consequences. Kidney failure patients in Pakistan have to depend on living donors, a dependence that has spawned a thriving trade in organs. Live donors charge anything between $2,000-5,000 for 'donating' their kidneys. The money thus earned is used for a variety of purposes including marriages, house building, loan repayments, drug abuse or simply to have a good time. Mohammad Riaz, a 22-year-old labourer from the district of Sargodha in central Punjab, arrived in his village loaded with cash and proceeded to spend it liberally entertaining his friends for a couple of months before he ran out of money. Villagers later learnt that he had sold off his kidney. Paranoid that he may kill himself if he tries to do hard labour with only one kidney, Riaz has since taken to begging. Robbed by unscrupulous middlemen, hundreds of others have also been driven by grinding poverty into selling their kidneys to pay off debts. Sargodha, otherwise famous for housing the headquarters of the Pakistan Air Force, has in recent years emerged as a hotbed of the kidney trade. Adib Rizvi, one of SIUT's founders, said at a symposium last year that the area had become the principal supplier of kidneys to most of Asia. 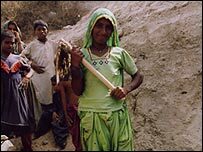 In mid-2003, a Punjab government inquiry estimated that nearly 3,500 people from Sargodha had sold their kidneys through the 1990s to buyers from around the world. Last year in the UK, a 33-year-old property developer sparked a lively debate on the ethics of buying from living donors when he bought a kidney from an impoverished young girl for about $5,000. There is no such debate in Pakistan, where the absence of relevant laws continues to fuel the trade. Hospitals in Rawalpindi which provide transplant facilities have hundreds of 'donors' listed with them. They have little to fear from the law. The government continues to drag its feet, worried about a possible backlash from orthodox religious lobbies. A draft bill allowing such transplants has been pending in the Senate since 1992. The government's fears may be unfounded, given that essential organ transplants from dead people are legal over most of the Muslim world, including Saudi Arabia and Iran. Pakistan and Bangladesh, in fact, are the only two nations in Asia which do not have legislation governing them. In such circumstances, the only check on the practice has come from scrupulous hospitals. The SIUT, Pakistan's most famous and reputed transplant facility, is one example. Of about 1,200 cases it has dealt with over the last decade, 72% of the donors have been the patient's parents. The remainder were close relatives. But not all hospitals are ethical, given the earnings involved. The cost of a transplant at a private hospital, once a kidney is procured, is often in excess of $5,000. Post-operative treatment costs an additional $300-500 a month for the next few years. Even these rates are arbitrary, depending on the status of the patient. But in a country driven by chronic poverty, illiteracy and greed, a few thousands dollars are enough to push some to take the extreme step.